Double Reed Day is open to double reed players of all ages and levels. Join the UWM Music Department’s double reed faculty and your fellow players for a day of master classes, workshops, and faculty and ensemble performances. Enjoy a pizza lunch, raffle, and presentation by our vendors. Take time to browse the double reed vendors, try new bassoons and oboes, sight read with other participants, try an English Horn or Contrabassoon, and end the day with a recital featuring UWM faculty and the Double Reed Day Ensemble. Try the English Horn and Contrabassoon! Handmade reeds, supplies, instruments, music, and much more! 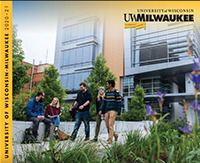 Visit uwm.edu/map for map and directions to campus. All Double Reed Day events are held in the UWM Helene Zelazo Center for the Performing Arts (with the exception of the walking campus tour). You are encouraged to use metered street parking or metered parking in the lot immediately south of the Zelazo Center. There is additional parking in the underground parking garage at the UWM Union. Double Reed Choir music will be assigned to students based on years of study. All music will be furnished by the UWM Band Department. Students must provide their own pencils and all other necessary equipment for rehearsals.